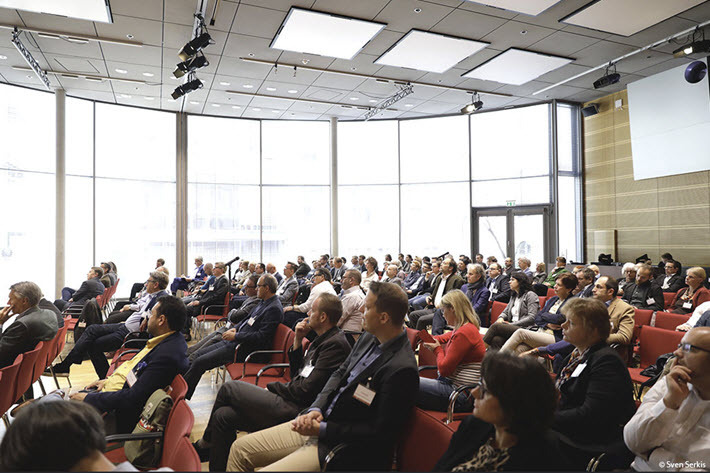 From subscription, crowdfunding, narrative development, and audio-first production, a quartet of speakers at Klopotek’s annual Publishers’ Forum talk about the possibilities, and some realities. 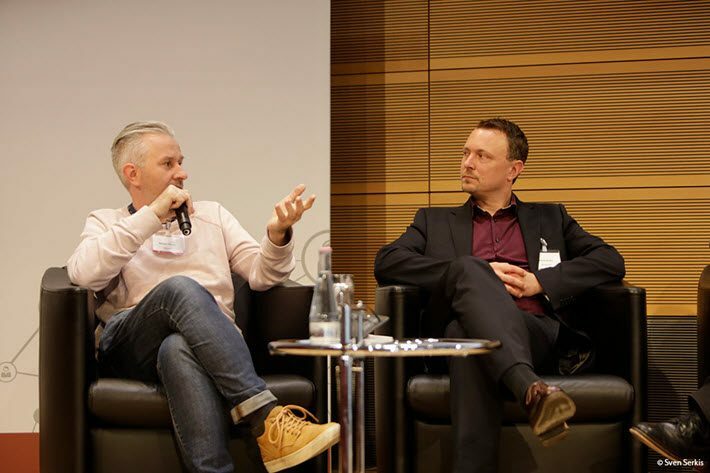 At Klopotek’s Publishers’ Forum in Berlin late last month, the conference’s director Rüdiger Wischenbart’s theme of “Going Full Circle” was reflected immediately in the fact that two of four speakers on the “New Publishing Models” are based in audiobooks today. And while the gratifying sales many publishers are experiencing in audiobooks in several international markets today may be new, the format, of course, is not. While many might like to complain about the challenges of the digital transition, one of its gifts is downloads and streaming. And that’s what’s made audiobooks fly, much as digital technology suddenly accelerated the consumer photography market years ago. This was part of an onstage conversation that brought together issues of technical capability and creative vision in terms of where needs and niches might come together in the contemporary publishing industry. In terms of industry dynamics, this quartet of speakers touches on four over-arching factors at play: audio as the “originating” format; subscription; crowdfunding; and author process. Today, we survey some of what each speaker said. At a time when some in publishing are pointing out that cinematic arts may be taking the traditional storytelling lead from book publishers, Garcia has, in a sense, begun doing what we see some television and film production companies doing: going first. He has formed a company to produce and market audiobooks, not for a publisher but for a big-name author. In case you’re not familiar with Funke, she has sold more than 20 million copies of her books worldwide, perhaps best known for her 2003-2008 trilogy, Inkheart. Listed in 2005 as one of Time’s 100 most influential people, she has served as a German ambassadors of the UN Decade on Biodiversity program, and—originally from Dorsten and Hamburg—today is based in Los Angeles. The startup, Garcia says, is a collaboration between the two in which he and Funke have full control—and own full rights—to their work together, which is born as audio. Their first production together in this new shared imprint is Dragon Rider: The Griffin’s Feather: With Ben and His Dragon, and you can listen to some of the sort of music-filled soundscape that Garcia and Funke are working in here. A shop is ready for fans here, with hoodies as well as audio for sale. 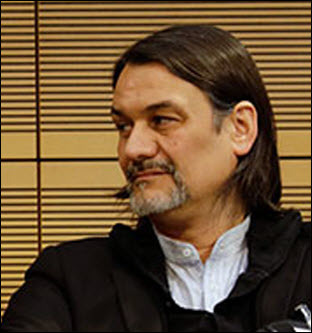 “I’m excited,” Garcia told the Publishers’ Forum audience, “to have just flown to Berlin from New York” where he was working on the planned release of “what we’re calling our first American audio.” He and Funke are hoping to find traction in the US market. And what Garcia’s new company illustrates is a point made by keynote speaker Laura Nevanlinna of Kaiken, that the books industry may increasingly need to think of making liaisons, collaborative partnerships like Atmende Bücher, in order to get the multi-channel capability they may need in a rapidly expanding digital marketplace. “We’re trying now,” Garcia said, “to see what kind of distribution arrangements we can make by producing audio first” with the products that he and Funke are beginning to release. As Publishing Perspectives readers know, Storytel is the audiobook subscription service founded by Jonas Tellander and Jan Hauksson. Created in 2005 as Bokilur, its name was changed two years later to Storytel, and it today is one of the most rapidly expanding audiobook subscription programs in the world. It’s an all-you-can-listen-to subscription (as opposed, for example, to the one-book-per-month basic subscription at Audible), and has made several acquisitions–among them Earbook, Storyside, Mofibo, Kontentan, and People’s Press–in order to establish itself. The company’s site features 30 international markets as targets, and as we mentioned in our interview last week in Abu Dhabi with another audiobook service, Kitab Sawti, Storytel has most recently entered the United Arab Emirates. 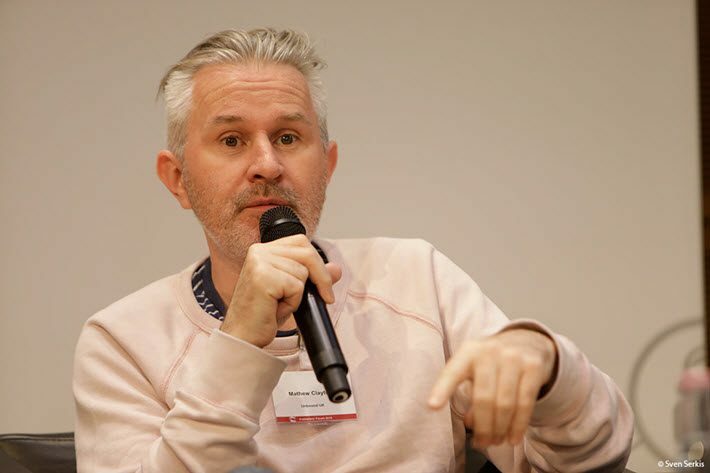 Ironically, Gustafsson, who heads up international publishing at the company in Stockholm, feels that Storytel’s moves into new markets isn’t going fast enough, even as many others are surprised at how quickly it’s going. Gustafsson also pointed to an interesting publishing meme that, like many, can sometimes be much less informative than thought. “Everyone in book publishing in Sweden,” she said, “always says that they’re not going to make the same mistakes the music industry made. But then, when you ask them what mistakes the music industry made, they can’t tell you what they are.” There seems to be, she said, a fear of subscriptions less grounded in reality than in such unspecified concerns. What’s more, she said, the subscriber universe is less concerned with the age of an audiobook’s content. Backlist can find new life, even as Storytel, itself, she said, moves more and more into creating original content, too. Either way, “it’s new to the subscriber,” Gustafsson said. The UK’s Unbound is another company with which many Publishing Perspectives readers are familiar, having been in operation now in about six-and-a-half years. Working not unlike Kickstarter, the company raises funding for its titles through crowdfunding-curation: to be successful, a project must gather a certain amount of funding, and the reader-backers of a given book are then seen as shareholders, hopefully with a sense of ownership about a title in which they’ve invested. The familiar theory here is that you create that book’s readership in the process and, with luck, a kind of automatic street team of consumers who will talk up the book to others. “We’re also full publishers. We edit, print,” and then distribute the books produced by the program. Clayton spoke of how, in fact, if anything one element the team had thought might develop is that of the repeat investor, who has a happy experience of backing a book and wants to do it again for another title. “We do have repeats but not as many as we’d like. The average spend,” he said, “is £37 (US$50) and that really funds the normal mechanics of publishing. “We’ve had about 150,000 people pledge on the site, and about 20 percent of them have pledged for more than one book.” The company still is in the early stages of developing community among donors, Clayton said, and it’s something they’d like to do more. As an example of how Unbound works, there currently is a book called Head Shot on the site by Vogue model Victoria Nixon. One of the projects with some star power behind it, it has been 70-percent funded by 82 interested backers, at this writing. For even greater celebrity kick, look at Help the Witch by Sunday Times bestselling author Tom Cox (The Good, the Bad, and the Furry) which, at this writing, has drawn an impressive 1,095 backers who have together provided 249 percent of the pledges requested. Like any publishing house’s big books, this can presumably help Unbound handle the projects that have less opulent response. And then there’s Bangs Carey-Campbell’s 96-percent-funded The Pocket Cheerleader: A Positive Guide to the Life-Changing Power of Movement, billed as “all the motivation you need to work out”–perhaps with an audiobook edition that readers can listen to while at the gym. “Crowdfunding works really well for authors who come with a strong online audience,” Clayton said. In fact, he said, that strong following may outweigh celebrity. “We’ve done things with established authors, too, they’re great for us” because they offer a kind of proof of viability in their interest in working with Unbound, “but they’re not our mainstay.” He used comedian, actor, scriptwriter Terry Jones as an example of a brand-name author “who’s done really, really well for us, but it really is a social-media talent” who can fund a project most quickly. There still is a lot of experimentation built into the Unbound model, Clayton said. And that, at times, he said, can cause real challenges, too. Just last month, Unbound’s editorial team was cut by a third–with four editors being laid off. Clayton said this unhappy reality had occurred as a result of “an experiment that didn’t work as well as we thought it might do.” The company had wanted to try leading with editors who would develop content based along genre lines, but it proved not to be a workable format. “It was my team,” Clayton said, “and we went from three people to 12,” only to find that the approach wasn’t working after about a year. In talking about this to The Bookseller’s Heloise Wood, Unbound’s Dan Kieran did say that Unbound had broken its own crowdfunding records for three months, raising more than £200,000 per month. Beemgee may be more easily explained as what it’s not than as what it is. It’s not a self-publishing operation. It’s not a publisher at all. 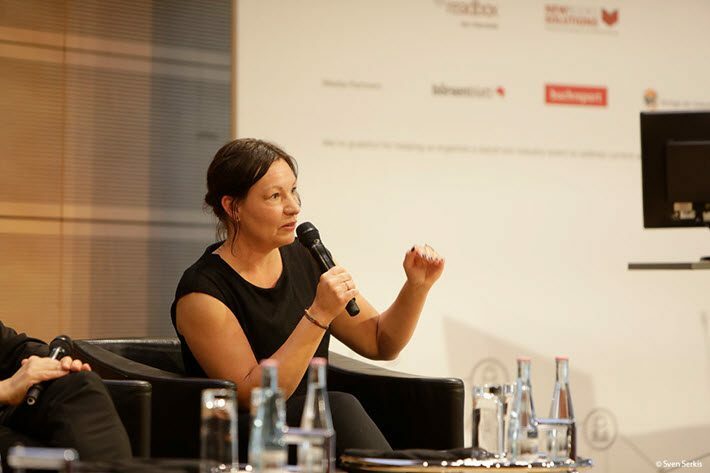 “It’s literally taking the process of plotting on index cards on a wall,” as many authors will do, “and taking that digitally,” Becker said to the Publishers’ Forum audience in Berlin. “It’s a tool where you can write your plot points on small cards, then enrich these points with media data. You can also work on your characters, the narrative, work on the chronology of events. “When you’re done with the process, it’s the essence of the story. But its not bound to any medium. You can go off and make a movie or an audiobook, or you can write a book. We wanted to make not a new writing tool but a tool for structure and planning” that authors can use to think through their projects and experiment with story development in ways that standard writing programs don’t provide. Where the interest for many publishers may lie is that Beemgee lies in the cloud and thus can be accessed by both author and a colleague–perhaps a publishing house editor–at once. Collaborative creative opportunities, then, are the stock in trade of this company, which was quietly launched about three years ago in Germany. Becker and his associates tested this with two authors and their projects at the German publisher Carlsen. “And then we spent about three hours on the phone,” assessing how the projects had gone. “The authors got so many new insights into their stories that they grasped the problems their characters had” and where issues with the narratives lay. Currently, the system is paid for by authors using it, for about €60 annually (US$72), but Becker said that the company is fully open to working with publishers, who might make a bulk purchase of a certain number of licenses to then use with editors who can collaborate with authors at the very early stages of development on new projects. “We want it to be playful,” Becker said, freeing the author–and editor–from what might normally be the constraints of business expectations too early for creativity. One product to come from the early uses of Beemgee, Becker said, is a computer game. More from Publishing Perspectives on Publishers’ Forum is here.